Nice score and its awesome that they fixed his hand. Only thing is you don't get his weapons. He is still coming with his pistols right? I imagine so. I've a Mirror Master lined up from someone selling off their subscription. So I'm just hedging my bets in case they really don't change that closed fist. Oh that's awesome, I'm thinking I want 5 of him! Wow, nice changes on this figure Mattel! I guess this might be one where I could use more than one figure. I love the artwork on the package too. Mirror Master is another character choice I put in the "interesting category". Why? Because in all the years DC Direct has made 6 inch DC figures, we've gotten only a handful of Flash villains. The first 2 were Captain Cold and Mirror Master. I think Grodd and Zoom are the only other two. Mattel has now given us the same 4 and Capt Boomerang. MM does get points for being on the Super Friends, being in JLU, and being in the most recent DC Animated feature, Justice League Doom. 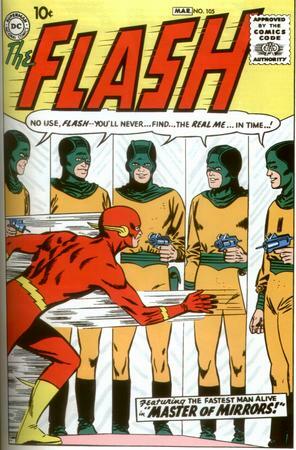 But what about all the other cool villains Flash has? (cue Ryan). "I'll always be a Toys 'R' Us kid..."
DC Direct Captain Boomerang from IC is Digger's son. We still need a good classic Captain, since Mattel gave us a modern version. I still have hopes for more Flash Rogues one day. And, Mirror Master was on Super Friends?